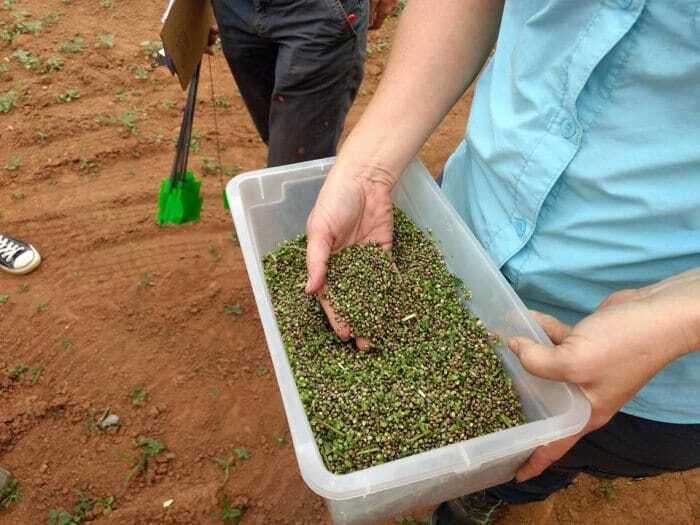 North Carolina State University Extension researchers harvested seed from their industrial hemp test plots on Friday – and were pleased with the results. Cultivating industrial hemp in North Carolina became legal in late 2015; however planting didn’t commence immediately. The supporting law was modified in 2016 and temporary rules were adopted in February this year. Applications started being accepted late in February, but then a process for growers to acquire industrial hemp seed had to be developed. With that issue finally sorted in May, Extension’s first industrial hemp variety trial was eventually planted on June 19, 2017. The study is examining 15 varieties of industrial hemp, some for seed and others for fiber, and different planting methods. It appears the long wait and hard work has paid off. “Our industrial hemp test plots at the Mountain Research Station in Waynesville give grain yields exceeding our expectations!” said an excited Dr. Jeanine Davis, an extension specialist in the Department of Horticultural Science at North Carolina State University. Dr. Davis heads the NC Alternative Crops and Organics Program. “I think all of us enjoy having agriculture in our region. Being able to produce local food is important, and, if we we could add a new high-value crop like industrial hemp to the mix, it’s all the better,” stated Dr. Davis. It seems fiber yields in the varieties yet to be harvested will also be beyond what the researchers expected. The state’s pilot program is investigating the viability of industrial hemp in North Carolina, with 11 possible research purposes identified in the state’s laws. All industrial hemp grown under the program is subject to testing for THC levels, a psychoactive compound in cannabis, and must have a THC level of 0.3 percent or less. NC State Extension is the largest outreach program at NC State University. Earlier this month, the Extension team held its annual Alternative Crops and Organics Field Day at the Mountain Research Station. It probably won’t be any surprise that one of the most popular aspects of the tour was the industrial hemp variety trial and planting method study. In related news, North Carolina’s Industrial Hemp Commission announced late last week it will be holding a public meeting via telephone conference call on August 30 to review and approve research pilot program applications.